climate change Archives | California Trout, Inc.
California Trout was recently featured in Scientific American for our meadows restoration project in the Eastern Sierras. Meadow restoration will play a huge role in improving carbon storage and reducing atmospheric greenhouse gases. Meadows have become severely degraded from logging and grazing activities which compact soils, erode streams, and depletes native biodiversity. The impacts to wildlife are clear– decreased habitat, lack of water and food– but this is also a big issue for maintaining a healthy climate. Degraded land is unable to store as much carbon as it could in its original state. We are missing out on a major source of carbon storage since soil stores three times more CO2 than vegetation and the atmosphere combined. Less carbon stored in the earth means more released into our atmosphere, accelerating climate change. Our researchers will be tracking the restoration project progress by comparing greenhouse gas activity between restored meadows and geographically similar degraded sites. In addition to the climate benefits, meadow restoration has numerous other ecosystem benefits. 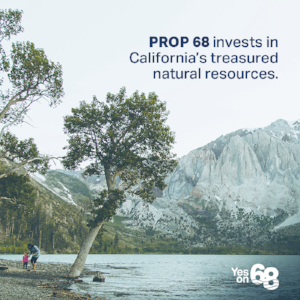 Habitat is improved for wildlife, such as the golden trout, willow flycatchers and other endangered species, and water storage capacity increases, a crucial benefit for our dry state. “We’re poised to do something that’s never been done with alpine meadows”, says Mark Drew in the article, CalTrout’s Sierra Program Director. He was a leader in establishing the Sierra Meadows Partnership (formed in 2015) which includes multiple key partners, such as the U.S. Forest Service. The Partnership’s goal is to restore 30,000 acres of meadows within the next 15 years. (Read more about CalTrout’s meadows projects here). See below for the full article from Scientific American, Can Meadows Rescue the Planet from CO2? After two years of project permitting, compliance and design, California Trout, with funding and support from National Fish and Wildlife Foundation, California Department of Fish and Wildlife, and the Kern Community Foundation, has completed the restoration stage of Osa Meadow in the Sequoia National Forest. During the first two weeks of September 2016, CalTrout carried out plans to restore hydrologic functionality to Osa Meadow, a focal area of CalTrout’s meadows work. Our goal is to create greater ecological resilience of Osa Meadow to climate change and provide suitable habitat for Kern River rainbow trout. Restoration at Osa consisted of filling degraded gullies that had disconnected a key water channel, Osa Creek, from providing water to the larger meadow. Osa Creek recharged groundwater sources and improved meadow hydrology. In the past, the lowering of the water table caused by the degraded gully resulted in the drying out of Osa meadow. Osa meadows is a long-term study site for the CalTrout-spearheaded assessment of greenhouse gas fluxes in Sierra meadows, which aims to answer whether restored meadows are sequestering a significantly larger amount of carbon compared to degraded meadows. The working hypothesis is that currently degraded meadows are not able to store as much water that would otherwise contribute to the buildup of organic matter (e.g., carbon and below-ground biomass). By restoring the health of meadows, organic matter will accumulate and therefore store (sequester) more carbon than un-restored meadows. In addition to sequestering carbon, healthy meadows habitat is important for the recovery and survival of native fish and wildlife. Through our post-restoration monitoring, we’ll be evaluating the effectiveness of the project in reconnecting this important headwater meadow to historic rainbow trout streams. overview of the Sierra Meadows Partnership and its work to develop a protocol to quantify greenhouse gas emissions in Sierra meadows and to establish related carbon credits that could be transacted in a carbon market. Funds raised through selling the credits could support meadow restoration and management. Sierra meadows are the first stop for the flakes of snow and drops of rain that comprise the water supply for most Californians. With climate change models projecting that more rain and less snow will fall in the Sierra in decades to come, the role that meadows play in storing water is likely to become even more important. To read the full oped in the Sacramento Bee, click here. On February 9th-12th, 2016 California Trout, with support from partners, National Fish & Wildlife Foundation and the CA Dept. of Fish & Wildlife organized the second Sierra Meadows Workshop at Mayacamas Ranch in Calistoga, California. Over the three days, there were approximately 70 workshop attendees representing more than 20 different State and Federal, non-profit environmental, academic and private consulting agencies. The purpose of the workshop was to continue to build a broader meadows partnership with a focus on (1) how restoration affects greenhouse gas dynamics and the potential for developing “carbon credits” and (2) development of a Sierra Meadow Strategy and Prioritization Framework necessary to increase the pace and scale of meadow restoration in the greater Sierra. The first day’s discussions and presentations focused on updates on the research being done to quantify the potential carbon sequestration of restored meadow systems as well as a proposed road map towards carbon accreditation. Days two and three were dedicated to continuing work on a proposed Sierra Strategy and Prioritization document to provide a conservation and restoration framework for practitioners, land-managers, funders and policy-makers. To view the workshop agenda and minutes, . Outcomes of the workshop include (1) an understanding of current projects involving GHG research in combination with restoration, (2) the process of and barriers to payment for ecosystem services in meadows, (3) direction for completion of the Strategy and Prioritization document and (4) the decision to move efforts forward as the Sierra Meadows Partnership. The workshop was very supportive in continuing and increasing momentum for meadow restoration in the Sierra along with the strengthening of an ongoing partnership. Click here to learn more about CalTrout’s Sierra Headwaters Keystone Initiative and the efforts to restore Sierra meadows. Mammoth Lakes, Calif. – How does a robust Sierra meadows ecosystem help fight climate change? That is a question that non-profit group California Trout is preparing to answer. The organization received a grant for $922,000 from the California Department of Fish and Wildlife as part of a package of $21 million in funding aimed at reducing greenhouse gases statewide. The funding comes from California’s Greenhouse Gas Reduction Fund, which is supported by the state’s cap-and-trade auction proceeds. San Francisco-based California Trout will leverage the grant to develop a protocol for measuring carbon sequestration associated with restoring meadows in the Eastern Sierra. In addition to sequestering carbon, meadows play an important role in supporting healthy watershed systems throughout the Sierra Nevada that are so critical to California’s water supply. Sierra watersheds also provide essential habitat critical to the recovery and survival of native fish and other wildlife in the state. The recent grant from CDFW will allow California Trout, with core partners Plumas Corporation and Stillwater Sciences, to lead a new multi-organizational effort to create a standard quantification protocol for measuring greenhouse gas dynamics in Sierra Nevada meadows. This effort evolved out of ongoing conversations among a broad coalition of groups, academic institutions and agencies working to support conservation in the Sierra. These groups include Sierra Foothill Conservancy; American Rivers; Sierra Streams Institute; Spatial Informatics Group – Natural Assets Laboratory; South Yuba River Citizens League; Truckee River Watershed Council; University of Nevada, Reno; University of California, Merced; University of California, Davis; California State University, Chico; Tahoe National Forest; and, Sequoia National Forest. As a result of this project and the support of the California Department of Fish & Wildlife, the Sierra Meadow Restoration Research Partnership will be established and will develop a tool to measure and credit carbon sequestration associated with restoring meadows throughout the Sierra Nevada mountain range. The partnership will coordinate with groups working throughout the Sierra with the goal of increasing ecological resilience and recovering species and habitat associated with alpine meadow systems – all while capturing climate-disrupting emissions on a meaningful scale. The partnership’s work will, in part, respond to the needs identified in the California State Water Action Plan to restore Sierra Nevada meadow systems. It will work to restore multiple meadow systems across the Sierra, including Osa Meadow, a 90 acre meadow system supporting Kern River rainbow trout, Mountain Yellow Legged Frog and local communities downstream. California Trout is a non-profit conservation organization that strives to solve complex resource issues while balancing the needs of wild fish and people through science-based advocacy. Some of its landmark achievements include legal victories that helped to restore the streams that feed the iconic Mono Lake and cutting-edge research aimed at recreating wetland habitat on off-season Central Valley farmland to support imperiled native salmon. With headquarters in San Francisco, the organization has six regional offices, including one in the Eastern Sierra Nevada. The Lyell Glacier is rapidly approaching a similar fate. A photograph from 1903 shows the Lyell Glacier as an unbroken swath of white. In the 110 years of melting since, the Lyell has been cleaved into two separate ice fields. The indications of disappearance are even more dramatic from the Lyell’s surface. High on a cliff on Mt. Lyell is a hand-painted orange letter “K.” When Point K was established in the 1930s, it was at the level of the ice; today, more than 120 feet of bare rock separate it from the glacier’s surface. The fading glaciers signal serious problems for the state’s already strained water supplies. A 2008 study conducted by a former hydrologist for Hetch Hetchy Water and Power, for example, predicted that 1.5 degrees Celsius of warming would trigger an uphill shift of snowpack by 2,000 feet by the end of the century – rendering nearly 60 percent of the Hetch Hetchy watershed snow-free by 2100. The Feather River, the main tributary of the Sacramento River, the state’s largest river (and key source of water to the State Water Project) is particularly vulnerable, says Michael Anderson, California’s state climatologist, since much of its snowpack is held at “lower” elevations between 5,000 and 6,000 feet. Most of California’s native trout, steelhead and salmon species are already at risk (see CalTrout’s “SOS: California’s Native Fish Crisis”); a loss of snowpack and glaciers isn’t going to help. For more information, visit With so many of California’s native trout, steelhead and salmon species at risk (see CalTrout’s “SOS: California’s Native Fish Crisis”CalTrout’s “Fish” web page.